100 Things to do in Ohio this Fall - Ohio. Find It Here. There is no season more beloved in Ohio than fall – it is the perfect time to create new memories, or Fallidays, with friends and family. We are bringing you the top 100 things to do in Ohio this fall to keep you celebrating all season long. Get out, explore and share your Fallidays with us using #FallidaysInOhio. Hit the trails! Explore Ohio’s Adventure Trails highlighting unique experiences based on your interests. From wine to aviation there is an Adventure Trail for every type of explorer! Click here to begin. See what’s popping at the Marion Popcorn Festival September 6-8, featuring the Popcorn Festival Parade and all your favorite snacks and treats. Find scarecrows galore at Washington Court House’s annual Scarecrow Festival, September 14-16. Discover the pawpaw, one of Ohio’s unique native fruits, at the Ohio Pawpaw Festival September 14-16 in Albany. Jam to live bluegrass music at the Covered Bridge Bluegrass Festival, September 22-23 in North Lewisburg. Catch a covered bridge tour and sample savory, fall food. Raise your glass at Oktoberfest Zinzinnati, September 21-23, the largest Oktoberfest in America! Sample award-winning chili at the annual Chili-Fest September 29 in downtown Chillicothe. Find millions of blooms at the Barberton Mum Fest, September 29-30. Admission is free! Win a Bavarian-style eating contest at the Germantown Pretzel Festival, September 22-23. Admission is free! Celebrate one of Cleveland’s best Halloween traditions with your little ones at Boo at the Zoo October 26-28 at the Cleveland Metroparks Zoo. 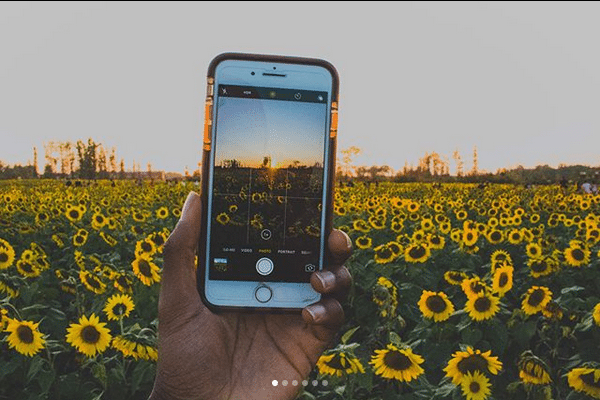 Channel your inner flowerchild at the Sunflower Festival October 6-7, at Gorman Heritage Farm in Evendale. Party on the Peninsula and take a tour of the Marblehead Lighthouse at the Lakeside Marblehead Lighthouse Festival, October 13, where you can also enjoy arts and crafts, mini-golf, a farmer’s market, and more. Sample crazy (and delicious) sauerkraut creations at the Ohio Sauerkraut Festival, October 13-14, one of the Midwest’s largest annual food and craft gatherings! Get your adrenaline pumping at Cedar Point’s HalloWeekends running weekends in September and October, with your favorite rides and attractions, challenging mazes, scare zones, and other spooky entertainment. 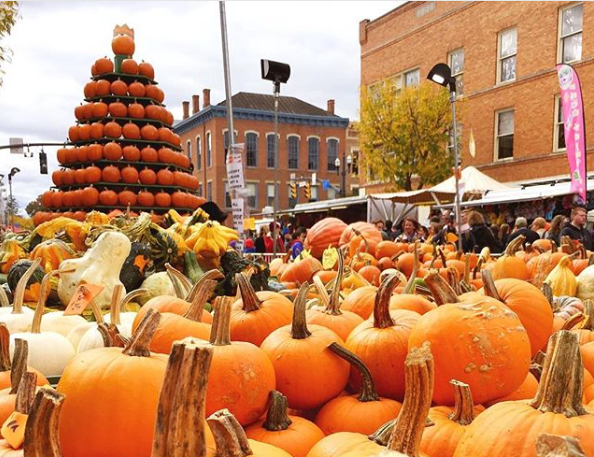 See who wins the coveted “Great Pumpkin Trophy” at the Circleville Pumpkin Show – one of the nation’s largest pumpkin festivals, full of your favorite pumpkin delicacies. Admission is free! Dress to impress at Highball Halloween, Columbus’ annual Halloween costume party and runway show in the Short North Arts District. Have a blast in the past at the Ohio Renaissance Festival in Harveysburg – named one of the nation’s best fall festivals by the Travel Channel! Grab your gang and your growler and head to the second annual Ale-O-Ween Festival, October 20 in Dayton. Presented by the Ohio Craft Brewers Association, this event is sure to bring no tricks, just treats. Channel your inner mad scientist and head to Spooktacular at Great Lakes Science Center in Cleveland, October 27-28. Costumes encouraged. Descend into fear as you take on the Sandusky County Dungeon Tours – a nighttime adventure that uses technology to track the spirit world at the 1840s Dungeon and Gallows Exhibition Hall. Send your adrenaline soaring at Lake Erie Fear Fest’s Ghostly Manor Thrill Center, with shivers around every corner. This year’s Fest combines multiple haunted attractions throughout October. Gather your gang for a unique tour of the Ohio craft beer scene on the Night Shift Limousine’s Craft Brewery Tour. Including three breweries, attendees can choose to take the tour in a traditional limo, or opt for a spooky night out in a unique hearse limo. Solve a murder mystery at Landoll’s Mohican Castle in Loudonville – dinner included. Listen to stories of the past at Fort Meigs in Perrysburg, where ghosts of dead soldiers will rise with the tales of years-gone-by during a frightfully fun stroll through grounds. Sample seasonal offerings like the Orange Eyes Pumpkin Ale from the Phoenix Brewing Company in Mansfield, housed in the haunted remains of what used to be a funeral home and mortuary back in the early 1900s. Tour where many have stayed before at The Golden Lamb in Lebanon. A historic landmark, travelers, historical figures and even 12 United States Presidents have gathered here since Ohio first became a state. With delicious food and comfortable lodging, many guests have felt welcome at the inn and tavern – and some have never left. Opt to glimpse into the paranormal world on an overnight ghost hunt or a tour of The Ohio State Reformatory in Mansfield, part of the ever-spooky, Haunted Mansfield Trail. Get spooked by the Athens Asylum Walking Tour, led by local historian George Eberts. Feel the names carved into the woodwork of the abandoned building – and try to imagine what it was like to live or work there between the 1870s to the 1990s, its years of operation. Get a glimpse of the past at Buxton Inn in Granville, a property that has served various purposes since its opening in 1812 – guests of the inn most often notice the lingering scent of a former proprietor’s sweet perfume, and feel her ghostly feline friend cuddling up with them in bed at night. Chase your fears at Camp Chase in Columbus, the site of a former Confederate prison and two-acre cemetery. A hotbed of ghostly sightings, it serves as the final resting place for more than 2,000 soldiers. Howl at the moon and visit Moonville Tunnel in McArthur, infamous for its paranormal activity. Be sure to catch their Midnight at Moonville event October 13 for music, crafts, spooky storytelling and more! Satisfy your sweet tooth at The Spot in Sidney. Try one of their delicious, fresh-baked creations – and look out for their seasonal pumpkin pie. Savor the season’s best flavors at Taft’s Ale House in Cincinnati, where you can try their Gourd to Death pumpkin beer. Sample some of the region’s best wines on the Lake Erie Shores and Islands wine trail with Northcoast Grapevine Tours in Lorain. Grab some grub at one of Ohio’s farm-to-table restaurants like Pickwick and Frolic in Toledo or Casa Nueva in Athens. Click here to plan your next locally-sourced date night! Get in the fall spirit with Ohio’s top distilleries like Candella’s in Youngstown or Tom’s Foolery in Cleveland. Click here for more of our favorites. Devour game-day eats at these Columbus locales – great for a pre-Buckeye game bite! Embark on your next foodie adventure on the Eaterarian Trail throughout Marion County, full of unique and interesting eateries. Be the next top chef and take a fall cooking class at Flowers and Bread in Clintonville. Sip some suds on Cleveland’s new Brewery Passport. Take your pick of 30 participating breweries. 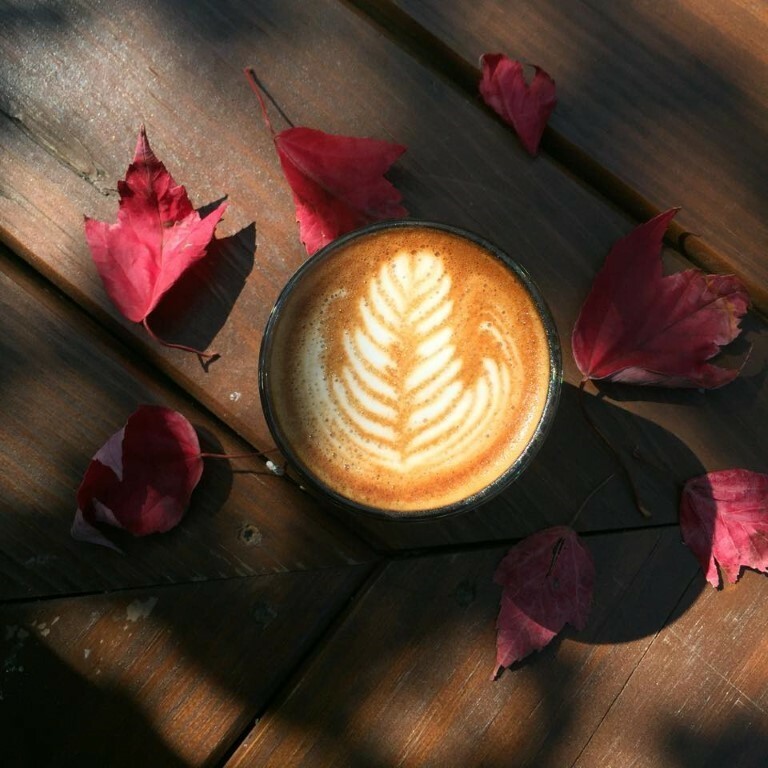 Taste pumpkin spice and everything nice at these local coffee shops serving up fall flavors. Showcase your Ohio spirit (and appetite) by touring the Buckeye Candy Trail. Sample the best buckeye candies the state has to offer! Take in the fall foliage with a fall color driving tour! Click here to view the dozens of routes available, courtesy of ODNR. Reach for the starts at John Glenn Astronomy Park, a new addition in the Hocking Hills equipped with a huge sundial and telescopes for your budding astronomer. Find the perfect pumpkin at an Ohio pumpkin patch. Click here for inspiration. Touchdown to victory at an Ohio State Football game in Columbus. See the full schedule here. Enjoy a hay ride at Fall Fun Weekends at Ridgeview Farms in Mesopotamia. Navigate through a corn maze, like the award-winning Tom’s Maze in Germantown. Once you’ve successfully completed the challenge, be sure to swing by the pumpkin farm on-site! Visit your old stomping grounds and head back to your favorite Ohio college town. Click here for a list of our favorites. Swing away at Top Golf, a sports entertainment complex with a high-tech golf game that everyone can play. Now in Columbus, West Chester and Cleveland. Snag the perfect apples for your next fall recipe. 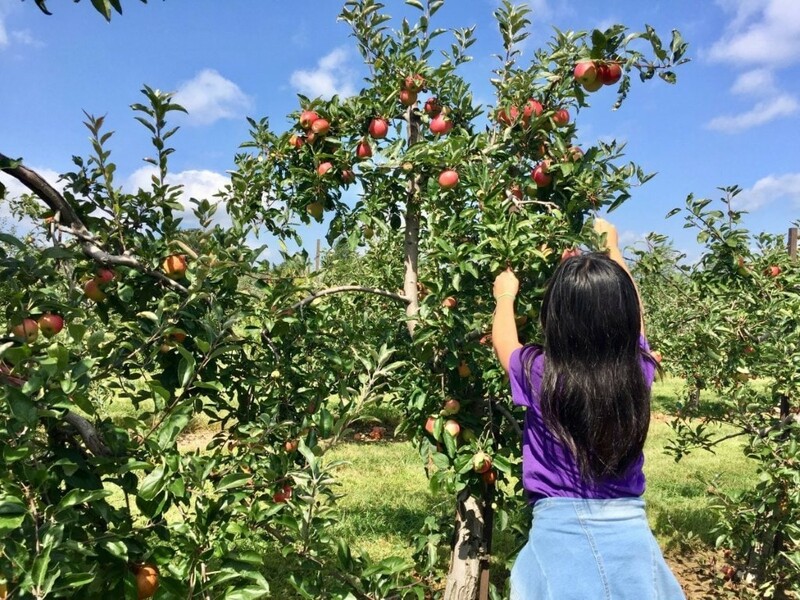 Click here for Ohio’s best you-pick farms. Discover Ohio’s covered bridges with a tour like the one featured on our Fall/Winter Calendar of Events. Get yours for free here. Getaway from it all in the fall! Take a long weekend to enjoy the beautiful scenery throughout Ohio. Click here for our list of amazing fall getaways. Roast sweet marshmallows at one of Ohio’s perfect destinations for a bonfire. Pour your own candle and create fall-scented magic at Petals & Wicks in Hamilton. Sample fresh cider at MacQueen’s Apple Barn & Cider Mill in Holland. Uncover more than 300 artifacts and 40 hands-on exhibits at the National Museum of the Great Lakes in Toledo. Explore infinite worlds (and pumpkins) at the Infinity Mirrors Exhibit at the Cleveland Museum of Art. Now through September 30. Spark your imagination at the Decorative Arts Center in Lancaster. The admission? Free. The Memories? Priceless. Gaze in awe at the Ohio River Floodwall Murals in Portsmouth, depicting southern Ohio’s rich history in colorful, lifelike paintings. Learn the art of stained glass by taking an instructional class at Bernie and Max Stained Glass in Chillicothe. Explore an ancient culture and see sophisticated, moon-aligned earthworks at the Newark Earthworks and Great Circle Museum. Find hidden treasures while shopping through one of Ohio’s amazing antiquing destinations. Get the creeps at Kings Island! Whether it’s the record-breaking roller coasters or hair-raising haunted trails that give you goosebumps, you’re sure to have a blast at the Warren County theme park’s annual Halloween Haunt. Take your season to new heights at Start Skydiving in Middletown, one of the top five largest drop–zones in the world. Snag thrills and chills at the new Lake Erie Shores & Islands Thrills Trail. Hunt the living dead at Zombie Paintball at Mapleside Farms in Brunswick where you’ll be recruited to the US Zombie Resistance Force – we are counting on you! Get your blood pumping as you zipline through the trees by moonlight at Camp Kern in Oregonia. Find freights and delights at Cedar Point’s Halloweekends. Kid activities during the day and spooky surprises at night! Click here for more information. Drive into your next adrenaline rush with an off-road ATV tour at R Adventure Park in Logan. Snag breathtaking views at Treefrog Canopy Tours in Glenmont. Paddle through fall color on one of Ohio’s many water trails. Pick your next adventure here. Get a bird’s eye view of an Ohio State Park from a fire tower like Mohican Fire Tower in Ashland County or Tappan Fire Tower in Tuscarawas County. Find your flower power in a sunflower field, like this one on the Tecumseh Land Trust in Yellow Springs. Channel your inner bowman and try your hand at archery at an Ohio State Park. Click here to find a range near you. “Hang out” among fall foliage at these seven best places to hammock in Ohio. Giddy-up on horseback as you ride through fall foliage on one of Ohio’s many equine trails. Click here for a list of bridle trails in Ohio’s State Parks. Hop aboard an open-air train car on the Hocking Valley Scenic Railway – the perfect fall activity for leaf peeping. Inspire your future outdoorsmen with these family-friendly fall hikes – perfect for backpackers young and old. 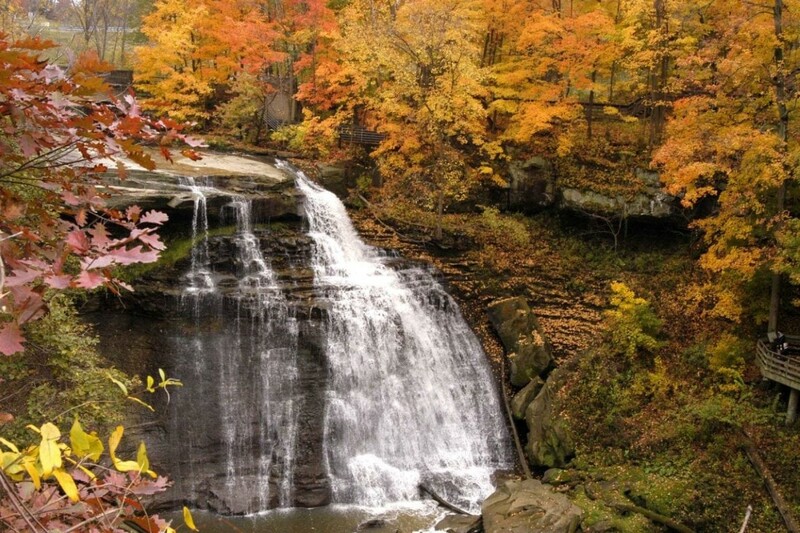 Capture Ohio’s fall beauty – use our guide for the most insta-worthy spots across the state! Enjoy the scenery on a Historic Canal Experience in Toledo where mules with pull you through the Miami and Erie Canal. Open your heart to history and go behind the scenes during Ohio Open Doors, September 7-16. This week some of your favorite historic buildings and landmarks open their doors with special tours and activities, not typically available to the public. Catch a fall sunset at the historic Malabar Farm in Lucas – built in 1939 by Pulitzer Prize-winning author, Louis Bromfield. Be amazed at historical architecture and the stories behind it as you visit these seven Ohio historic homes and estates. Roll back the clock with Sandusky Segwave. Take a one or two-hour tour exploring the historical significance of this charming coastal town. Take a tour of the National Museum of the U.S. Air Force, where you’ll find historic planes and artifacts of the U.S. Air Force – but keep your eyes and ears pealed for ghostly figures throughout the facility. Unexplained footsteps, eerie figures, and strange occurrences – all have been reported at this museum. Travel back in time at Loveland Castle and tour the grounds, known for their fall beauty. Cruise on the historic Muskingum River with a relaxing ride aboard the Lorena Sternwheeler in Zanesville. Be sure to catch a fall foliage tour, late September through October! Feel the rumble of thrilling drag races at National Trail Raceway in Hebron. Head out for one of their many events throughout the fall. Plan a spooky stay at The Lafayette – a historic hotel in Marietta known for its dark history and paranormal experiences. The property even offers its own “Ghost Hunters” package through October. Speed into your next adventure aboard the Euclid Beach Rocket Car, in Cleveland. With customizable routes and room for 10, your trip is sure to be out of this world. Spend a purrfect afternoon at an Ohio Cat Café and cozy up with some furry friends. Click here for a list of our favorite spots! Search for Bigfoot in one of Ohio’s State Parks – click here for inspiration. Uncover Ohio’s rich literary history at these five historic destinations. Discover details from famous funerals at the Famous Endings Museum in Dover – with artifacts and items from the funerals of Abraham Lincoln, Joe DiMaggio, Princess Diana and more. Admission is free. Bounce in the world’s largest bounce house, coming to Grove City September 7-9. Click here to learn more. Find Princess Poppy and more at the Troll Hole Museum in Alliance – home to the world’s largest troll collection. Peruse horse-drawn hearses and vintage funeral equipment at the Peoples Mortuary Museum in Marietta – a quirky museum meant to shed light on the unique and fascinating mortuary business. There you have it! How many can you check off your list this fall? For more falliday fun, Find It Here on Ohio.org.